Tad Friend, author of Cheerful Money: Me, My Family and the Last Days of Wasp Splendor (Little Brown and Company 2009), in an interview with WETA’s Bethanne Patrick on her show The Book Studio. In one segment, Friend (@ 4:50) answers the question of what is to endure in Wasp culture, given its decline. 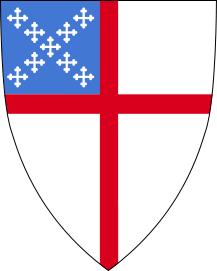 For related culture and behavior, read my post: Preppy 10 Commandments – Episcopal Style. 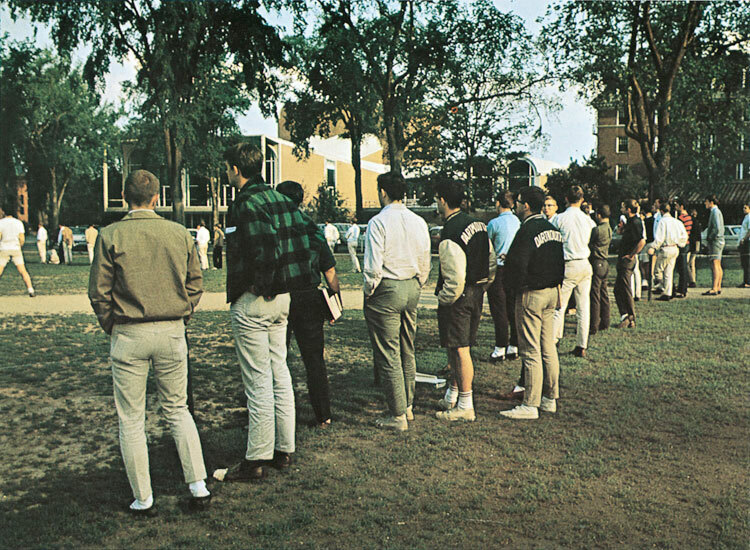 Preppies Protect Yourselves: Join PADL Today!! 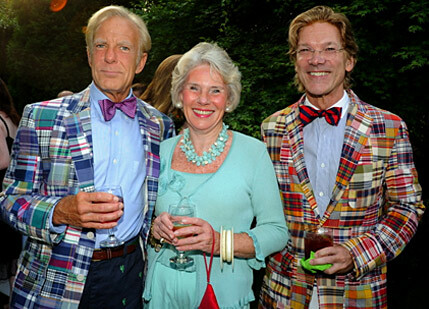 Lifetime Members of the Preppy Anti-Defamation Lague (L to R): John J. Balderdash III, Buffy Balderdash and John J. “Skip” Balderdash IV. Now is the time to consider joining or renewing your annual membership with PADL: Preppy Anti-Defamation League. 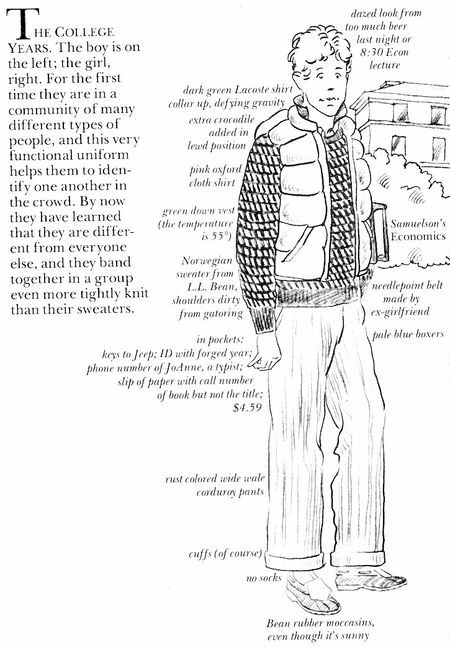 Summer is go-to-hell season, a time when Nantucket Reds, madras patchwork plaid and other clothes of blinding primary colors, which have been blamed on traffic accidents, are worn to the consternation of the legible-clothing-wearing general public. Other than a trust fund, your PADL membership is the best support mummy and daddy can give. Monty Python’s Upper Class Twit of the Year Show suggests that the landed gentry – at least in England – have their share of problems, too. Inbreeding can do awful things to the gene pool, as demonstrated by contestants Vivian Smith Smythe Smith, Simon Zinc Trumpet Harris, Nigel Incubator Jones, Gervais Brooke Hamster and Oliver St. John Mollusk. Real Hunter or Actor Boy Poseur? I’ll lay odds this clown couldn’t hit the side of a barn with buckshot at 20 yards, and I’d let him saw off the shotgun barrel to be fair. His hair and cynical demeanor read actor boy poseur or ironic hipster. 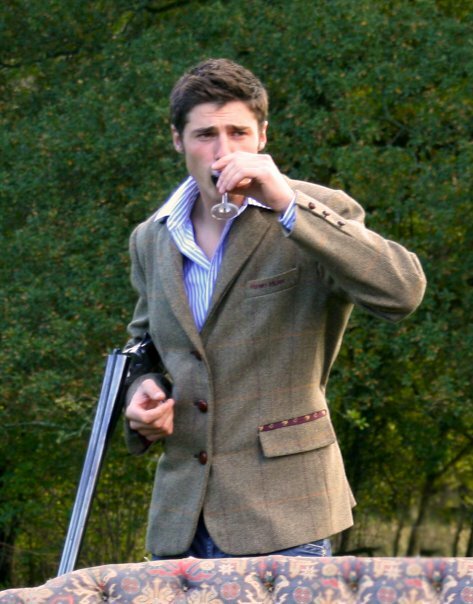 He attempts upper class references with the afternoon of shooting in the country theme – drinking a glass of sherry while wearing a tweed jacket that could have come from Richard of [the now defunct] WASP 101. But he’s edging toward the Bee Gees with his wide open shirt and collar sticking out over his lapels, a completely unconvincing act. Note: You need not be Episcopalian to follow these blessed commandments, for we are both traditional and prepumenical. 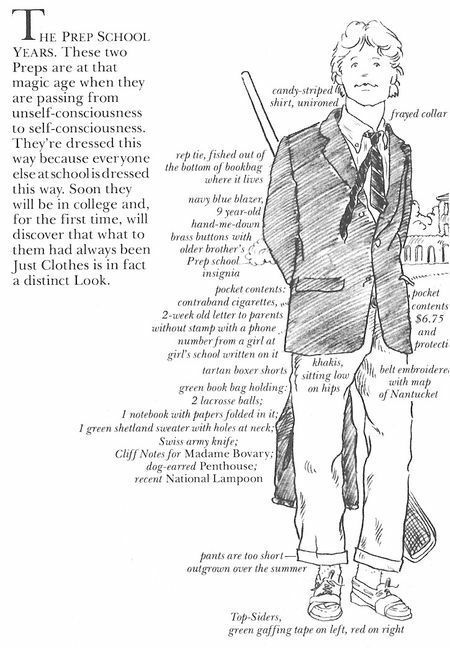 We welcome all who have been Madrasized into the household of preppiness. Thou shalt honor thy mummy and daddy, for they control thine inheritance, and grow not hair upon thy face, for it displeaseth them to look upon it. Thou shalt not wear unnatural fibers, excepting that it be Polar Fleece, nor shalt thou adorn thy neck or hands with bling. Thou shalt not wear cargo pants; neither shalt thou wear a fanny pack nor a belt hang down, for such things maketh thee to resemble the heathen. 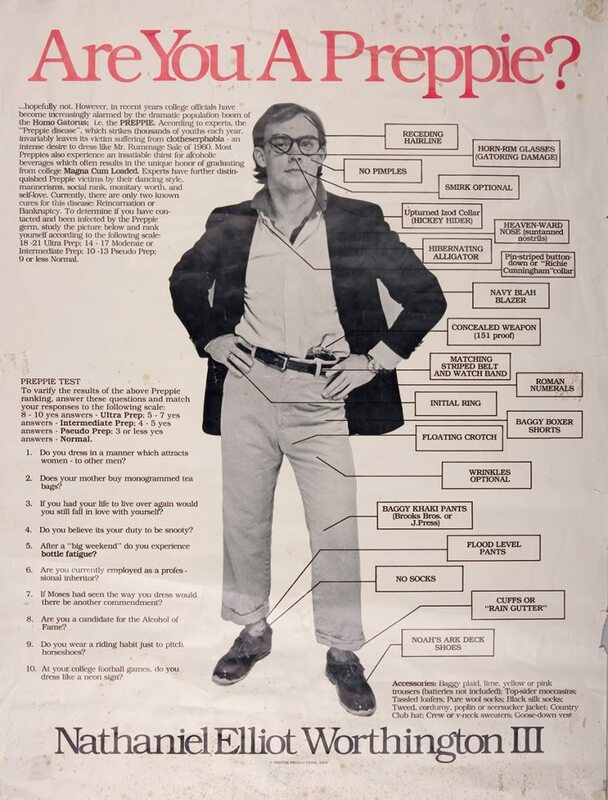 Thou shalt wear natural shouldered sport coats with the blessed 3/2 roll and cuffed plain front pants, for the Lord despiseth pleats, which are the work of the Devil. Thou shalt not wear seersucker before Memorial Day nor after Labor Day, for reverence of summer pleaseth the Lord. Thou shalt not eat meat with a salad fork; neither shalt thou drink water from thy finger bowl, for such things are an abomination. Thou shalt not add ice to thy Scotch, for it doth please the Lord that the golden nectar shouldst be consumed neat, and uncorrupted. Thou shalt write thank you notes to those who sendest thee gifts, for good manners are pleasing in the sight of the Lord and encourageth future gifting. Thou shalt not abide in the realm of NASCAR races, for such things doth attract the Philistines, who wear neither shirt nor shoes, and leadeth thee in the paths of unpreppiness. 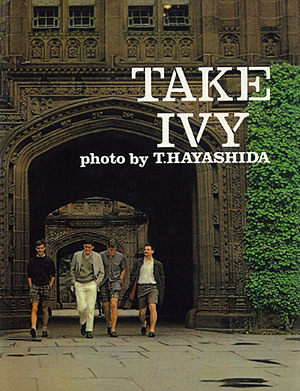 Thou shalt neither dwell in a monster mansion nor commit other vulgar displays of wealth; for thou shalt live unseen by the heathen, reveling in the simple joys of popped collars and critter embroidered pants all the days of thy life. Amen. Though the Lord doth look upon pleated pants for men to be the work of the Devil, His countenance doth look favorably upon pleated kilts worn by those of Scottish descent. The Lord doth look most favorably upon this practice for family tartans. Verily, I tell you that His mercy extendeth even unto to young ladies, though they be not of Scottish descent, at boarding schools with dress codes that requireth kilts.